Very simply, an ESC should tell you the number of amps it supplies to your motor (this is the ‘size’ of the ESC) along with additional information such as if it has a BEC or not, and what batteries it supports. The size of the ESC is the case above is 20A (the biggest font as it is the most important information), and the other information to to the right is smaller writing. If you’re looking for more information on BEC, please see the section 'What does BEC mean?’ below. What size of ESC do I need? 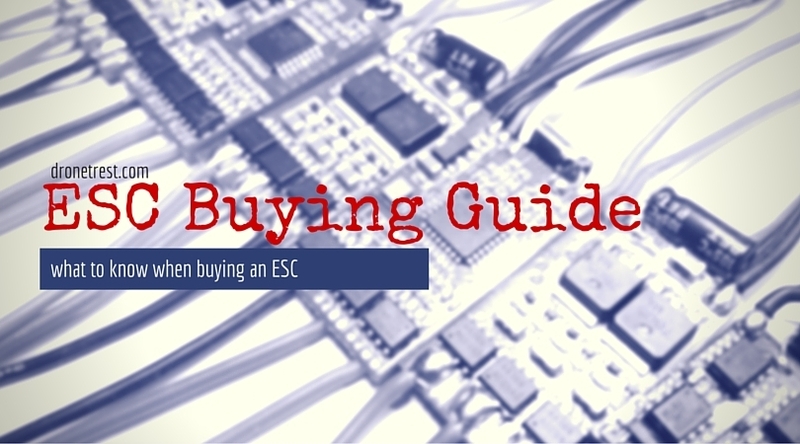 The first thing to consider when buying your ESCs is what size of ESC you need for your setup. Of course, when we talk about ‘size’ of ESC, we do not mean the physical size of the module, but of the amount of amperage it supplies to your motor. The standard range of ESC sizes is 12A-40A ESCs for quadcopters and other multi-rotors but you can get smaller and larger ones. To choose the right ESC for your needs, you have to also consider what motors you are going to use, and what propellers. The choice for these three essential pieces of equipment are entirely linked to one another and in order to make the right decision, you will need to use the thrust data table that should be provided with any multi-rotor motors. An example of such a data table is shown below. For more information on this procedure, please see our 'How to choose the right motor for your multicopter’ guide. Probably the second most important thing to know when purchasing an ESC, is what does BEC mean and do I need it? Technically, BEC stands for Battery Eliminating Circuit. In practice, this simply means that ESCs with a BEC are able to output a constant voltage and so power the equipment on board your flying platform, such as your receiver, servos or flight controller. It entirely depends on which flight controller you have, but many flight controller nowadays do not need to be powered via the ESCs. This is because you often have a separate power module with the flight controller which does the job. Therefore, you have no need for an ESC with BEC (in relation to powering the flight controller). However, you may want/need to power other equipment such as servos and receivers and in this case, an ESC with BEC will be necessary. Note: When powering other equipment with your ESC, it’s important to check the specifications of the ESC in question. The BEC will have a max current draw (in the case of the picture above, this is 2A), and you must check that the total current drawn from all servos/receivers etc. does not exceed this amount. You must also be aware of having several ESCs with BEC on the same multi-rotor. Having several BECs connected to your flight controller can cause interference with one another. Techicaly this mostly occurs with switching BEC’s, but its always best to be safe, so you should have only one ESC with BEC to eliminate this possibility. A common approach with the other ESC’s is to remove the power cable from each servo connector as shown below. Rather than cutting the wire you should simple unclip it from the connector, fold it back and insulate it with some electrical tape. This way you can re-enable the BEC power output if you need to use this ESC on another project. ESCs without BEC are often referred to as OPTO (optoisolator). All this means that that the part of the ESC that receivers the signal from your flight controller or R/C receiver is isolated from the higher voltage circuit that powers your motors. OPTO ESC’s are common on many multirotor setups as your dont always need a BEC as discussed above. Tip: ESCs with BEC are able to supply power to your on-board equipment. I always like to go with the general setup of having all but one ESC without BEC, and one with BEC.This way, there should be no interference between the ESCs and if I need to power anything like servos etc., I then have that option. With any ESC you will have a servo connector that connects to your flight controller. 95% of the time this will be a 3 wire connector, the middle wire (usualy Red) will be the power output (5V) the white wire (sometimes orange) is the signal wire. The black wire (sometimes brown) is the ground connector. However in some cases when using OPTO ESC’s you might only have two connectors, the signal and ground wires with a space in the middle. An example of a ESC servo connector is shown below. Do I really need pre-soldered ESC connectors? Another thing to consider is the various connectors that you may or may not need on your ESCs. Let’s start with the motor cables. These can come with bare tips, for manual soldering, or they can come with pre-soldered bullet connectors attached. These bullet connectors can then be plugged into the cables on your motors (if your motors come with these connectors pre-soldered as well). You therefore need to know if your motors come with these when buying your ESC. your motor cables, both on your motors and ESCs. You will often need to do this particularly with miniquad builds as there isn’t a lot of extra space for wrapping up excess cable. If you will need to customise the length of your cables, buying pre-soldered probably isn’t the best idea as you will just have to cut the bullet connectors off anyway and solder the cables together manually. Lengthening your ESC cables (with bullet connectors) need not be an issue however as you can buy a motor to ESC extension cable set which comes with pre-soldered bullet connectors. Tip: When considering buying pre-soldered bullet connectors on your ESC motor cables, it’s important to think of the bigger picture; what type of project are you undertaking? If it’s a miniquad build, buying bare tips on the motor cables will be a sensible idea as this leaves you free to customise the length of the cables (which you will likely need to do). If you’re going for a bigger build, pre-soldered bullet connectors wouldn’t be a bad choice as you can easily extend the length of the cables with an extension set. The next connector issue to consider is that of the battery connector. Obviously, ESCs need to be powered, and therefore they need to be connected to your battery in some way. ESCs can therefore come with pre-soldered battery connectors soldered onto the power cables of the ESC (the red and black cables). These connectors are usually one of the following: deans/T-plug, XT60, EC3 or EC5 as these are the classic battery connectors. If you need an ESC with a battery connector, you the obviously need to match it up with your battery. However, this need not come into consideration in the majority of cases due to the use of the power distribution board (PDB). Briefly, this is a device that distributes the power on your multi-rotor and this allows you to solder all the ESCs onto your PDB directly, and so there is no need for any of your ESCs to have a battery connector at all. You then solder a separate cable onto your PDB that connects to the battery in order to power the whole system. For more information on PDBs please see our Power Distribution Board buying guide. 4 in 1 ESC or 4 x 1 ESC? Another question you have to ask yourself (if you are building a quadcopter) is whether you want an ESC that is one unit but has all four ESCs incorporated e.g. the Quattro 4 x 20A ESC for Quadcopters or the standard 4 separate ESCs. There are advantages and disadvantages to both. If you opt for the 4in1 ESC, you don’t have to deal with soldering/wiring any power distribution boards, and you can just install the ESC with no fuss. Job done in 2 minutes. 4 in 1 ESC’s are also usualy cheaper than buying four individual ESC’s. However, the main disadvantage is that if one of the ESC fail in this module you will need to replace the entire unit which is a bit costly and annoying. This is obviously not the case with four separate ESCs. If one fails, you can simply replace this one ESC and get flying again. Tip: In my experience, I have almost always used four separate ESCs and a PDB. I do not find that the soldering of the ESCs onto the PDB is that tiresome and I prefer the flexibility four separate ESCs offer. However, the 4in1 could save you money and they rarely fail; the choice is really up to you! Types of Firmware - SimonK or BLHeli? Now, you will come across two main types of firmware that you can get on your ESCs; SimonK and BLHeli. There has been lots of discussion on the internet over the years on which is better and I think I can honestly say that nowadays, there is no discernible difference in performance. It used to be the case that SimonK firmware had issues when people tried to use them with motors with low KV ratings, but in the most recent versions, this has been eradicated. However, there is one distinguishing feature between these two firmware modes. 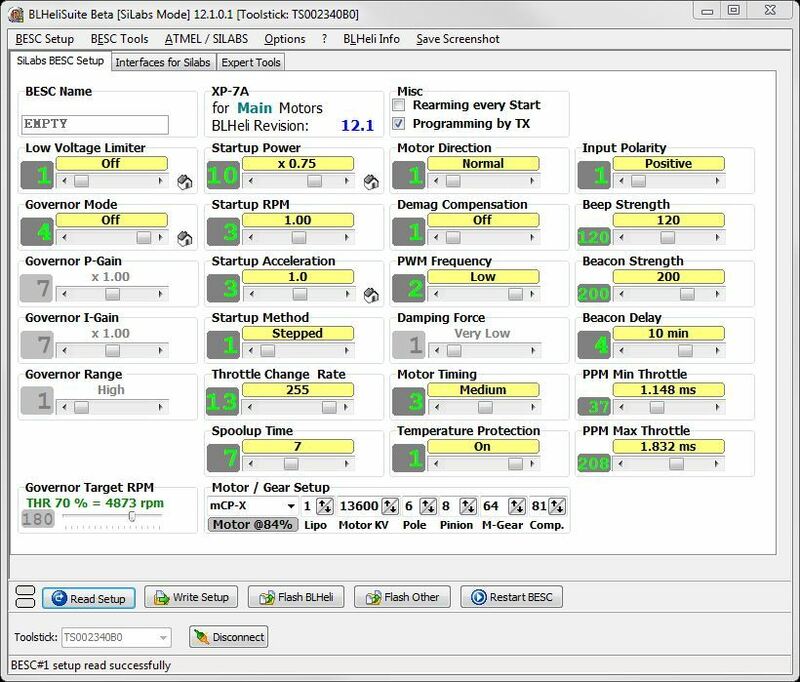 The BLHeli firmware allows the user to configure the settings of the ECS via your PC with the user interface BLHeli Suite. Generally, the musical tone method of configuring your ESC is just fine, but for a slightly more in-depth configuration process, the BLHeli route might be the way to go because of the BLHeli Suite. Below you can see a screen shot of the BLHei Suite. Note: In order to connector your ESC to your computer, you will need a USB Link board. Tip: In terms of performance, there is next to no difference between the two firmware. 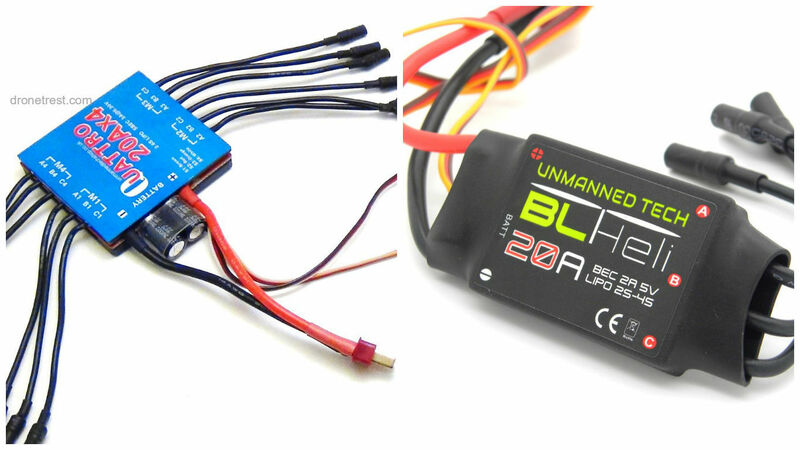 However, purely due to the fact that with the BLHeli firmware you can use the BLHeli Suite, I would recommend the BLHeli Series ESC. 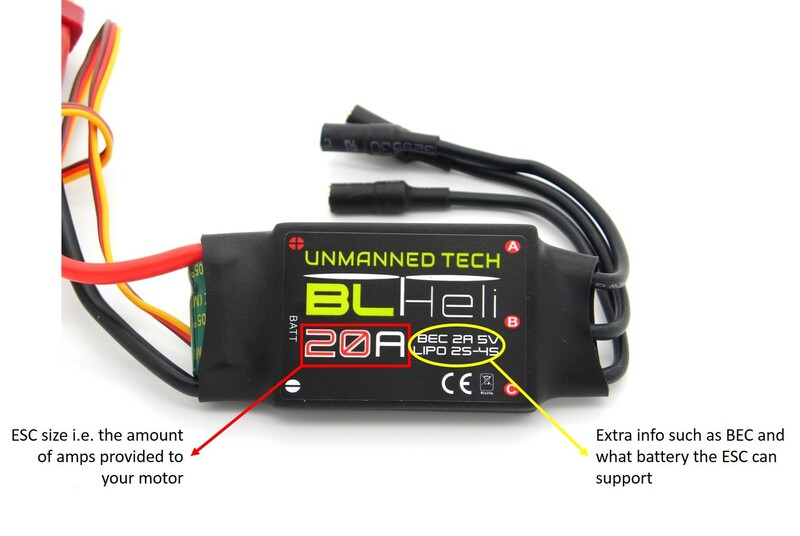 Also the BLHeli firmware has also recently added new features such as OneShot125 mode which provides ultra fast response between your ESC and supported flight controllers. BLheli also has an active breaking which will cause the motors to slow down faster which can help improve your multicopter performance as it reduces the chance of overshoot. What type of programming do you want? If you have or are looking to complete a multi-rotor setup, you do not necessarily need to worry about programming your ESCs. 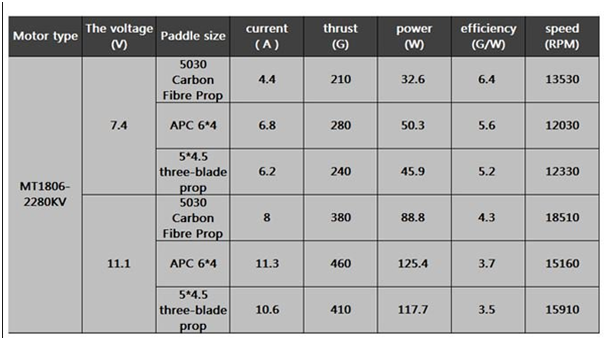 This is because you can ensure that you buy ESCs with multi-rotor specific firmware which come with pre-configured settings for multi-rotors. Such firmware are BLHeli and SimonK as mentioned above. Most ESCs are compatible with the musical tone method, but this gets very tiresome when configuring several ESCs but there is no need for extra equipment with this method. As for using a programming card, this is basically one step up from using the musical tone method but with lights. Programming cards are not exactly common however, and so I would recommend the USB connection method. Tip: In my personal experience, I would always recommend the USB connection method. This obviously involves connecting your ESC to your PC via a USB link board (as mentioned above) where you can program your ESC with relative ease and then save the settings. This method also allows you to upgrade the firmware on your ESC with the latest version which is always helpful. For ESC calibration uses, there is a useful little device that allows you to connect up to 8 ESCs together and so calibrate them all at once. This is the ESC calibration throttle hub for 8 ESCs. And that’s a rough guide to buying your ESCs! If you have any questions or suggestions, please let me know on the comments section below. So, you’ve chosen the necessary ESCs and motors for you and you now want to connect them; how do you do that? Well it’s pretty simply, if you want your motor to spin clockwise you connect your ESCs one way, and if you want them to spin counterclockwise, you swap the two outer motor cables. Please see the ESC to motor connection guide for a complete guide to this. When setting up your ESC’s on your drone you will almost always need to perform an ESC calibration, for more details check out our ESC calibration guide.